A clean-technology energy company was solving the operational and environmental problems of heavy oil extraction. It had patented a method that could dramatically reduce the environmental footprint of oil extraction without compromising the return on investment of the oil companies. The company needed to scale up so that it could handle faster crude flows. But there were real concerns that increased throughput might cause line erosion. A new pump was needed but it had to be precisely the right one. The production engineer chose Knovel for its in-depth research into pump installation and operations, recognizing the value of the broad resources on offer. As well as being a recognized reliable source for engineering information, Knovel includes interactive graphs, tables and equations for relevant oil throughput and pump behavior parameters. The facts found with Knovel supported their arguments in favor of the pump and helped engineers define optimal operating parameters to avoid line erosion, cavitation and system failure. Using Knovel, the correct pump and associated operating conditions were identified to successfully scale-up to a higher crude oil throughput. Since its installation, the pump has doubled the crude output in the target well in the pilot facility. Rapidly finding the right information in Knovel also accelerated the market entry for the new technology. This means that at the pilot facility, crude oil is already being extracted using an environmentally friendlier process and that the same changes can be made at other facilities in the near future. 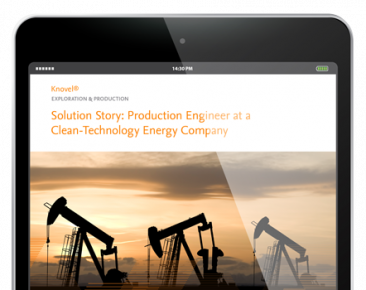 Knovel is a recognized, reliable source for engineering information, including interactive graphs, tables and equations for relevant oil throughput and pump behavior parameters.